This post features one of the articles published at CORDIS about the EUROTAPES project, which main goal is to develop superconducting tapes to improve energy efficiency in Europe. The SUMAN group, here at ICMAB, has actively participated in this European project, in a consortium that consists of 20 partners from 8 member states - 6 universities, 6 institutes, 1 technological center and 8 industrial companies. EU-funded researchers succeeded in substantially increasing the current that thin, high-temperature superconductor films can conduct without loss in lengths suitable for commercial use. Results can change the way energy is produced and transmitted, enabling for example lossless power grids or motors and generators, and can produce extremely powerful magnets. First discovered in 1911, superconductivity is a property of some materials to conduct electricity with very low power losses below a certain temperature. Unlike familiar conductors such as copper where part of the energy is lost as heat – which increases with the distance the charge travels – superconducting materials can carry immense currents without generating friction or heat losses, introducing a real solution to transmitting energy efficiently. However, commercially available superconductors currently work at very low temperatures, requiring expensive helium, and so the main applications up to now have been in powerful magnets. New superconductors that can work at higher temperatures help decrease cost by eliminating the need for costly or complex cooling to maintain them, or also work at liquid helium and generate ultra-high magnetic fields. Unfortunately, they are too brittle for normal wire forming processes. Within the EU-funded project EUROTAPES (European development of superconducting tapes: Integrating novel materials and architectures into cost effective processes for power applications and magnets), researchers introduced innovative methods to create thin, superconductor films with a superconducting transition temperature of up to 92 K (– 181 °C) that can efficiently transport current. The project team inserted nanoparticles as small as 4 nm in size in the matrix of the epitaxial YBa2Cu3O7 (YBCO) thin films produced by combining different deposition methods such as Pulsed Laser Deposition and chemical solution deposition (Ink Jet Printing) to get the best of both worlds. The tiny particles served to considerably increase the maximum current that superconductors can transport without losses, even under very high magnetic fields. Project activities targeted three different applications requiring testing conductors in varying magnetic field and temperature ranges to optimise performance, a key challenge. 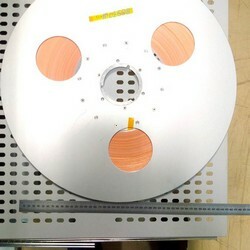 Specifically, researchers successfully developed: nanocomposite superconducting tapes and demonstrated good performances under ultra-high magnetic fields (exceeding 20 T) at low temperatures (4 K) using liquid helium as a coolant; motors and generators in high magnetic fields (3-5 T) refrigerated with cryocoolers at 30-50 K; and lastly, cables and fault current limiters at low magnetic fields (below 1 T) at relatively higher temperatures (65-77 K) using liquid nitrogen. Although liquid helium is expensive, it is currently the coolant for most superconductors used as magnets. The new superconducting tapes proved to have high performance under ultra-high magnetic fields and so they can be used to build a new generation of powerful magnets. Despite the fact that high-performance superconductors can totally revolutionise our energy systems, the largest obstacle to their implementation is the cost of production. EUROTAPES delivered a 600-m-long production unit of superconducting tape, further decreasing the €/kA ratio by using new methods and materials for their fabrication. In addition of Pulsed Laser Deposition , researchers also experimented with chemical solution deposition technique to more easily process the YBCO thin films. The method involved suspending nanoparticles to form colloidal solution inks and then printing them on top of a metallic substrate to produce the tape. A key part of the technique involved controlling the structure and stability of the created colloidal inks . ‘Retaining the single crystalline structure of the multilayered tape in hundreds of metres lengths was a major challenge that has been successfully addressed by EUROTAPES,’ says Project Coordinator Xavier Obradors. ‘To further increase the amount of current that the tape conducts, the epitaxial conductors integrated nanometric non-superconducting materials in addition to superconducting materials that modified the film structure,’ Obradors adds. Nanocomposite materials, particularly thin films and coatings, have a very broad industrial interest for many applications, and several methodologies developed within EUROTAPES can be transferred easily to other areas. Typical applications where large-area or long-length nanocoatings are required include solar cells, electrochromic windows, fuels cells and batteries.